'Push', a collection of four pieces performed by Sylvie Guillem and Russell Maliphant (who choreographed them) flattered and disappointed as much as it delivered. The opening night at the Sydney Opera House was the perfect example of a portmanteau program so patchy that a single answer to "Was it any good?" is hard to find. There are moments of beauty that still move somewhere between my eyes and my brain, they are shapes or trajectories, movements that looked and felt perfect for an instant and in doing so sustained themselves long afterward. At the same time so much seemed familiar and predictable. Cliché is the enemy of art and in the trawl through familar tropes many stones were rolled and few left unturned. The program opens with Sylvie Guillem dancing a piece called 'Solo'. There can be few more accomplished or starrier dancers and neither can there be many who control the whole theatre in a way where their craft speaks so much for them. The classical flamenco guitar provides the perfect foil for her physical control and grace. She leaves allows the Andalusian light and shade to permeate the piece so much so that still moments become a part of a one sided call and response. Guillem is beautifully musical, there are moments where she underscores the crescendo of each staccato passage are so subtle that it takes a time or two to realise how she does it. The second movement bathes her in a hard blue light and her limbs form arcs and tangents against the metronomic castanets. There is a whole map of Iberian posture and gesture from both the corrida and flamenco, that these are never delivered in quotation marks, but rather evoked and whispered is quietly accomplished. 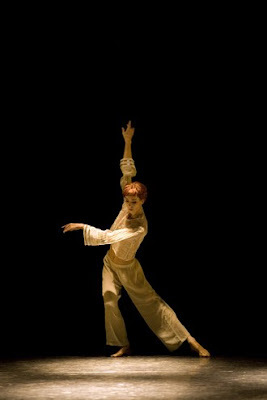 The third piece, another Guillem solo, begins with a portentous high contrast cone of light and the dancer virtually vogueing to the bones of a techno beat. It really does promise to be awful but almost imperceptibly and with incredible control Guillem increases the pace of her movement, still in that tight defined spotlight, and as she does the audience collectively forget to breath. Guillem's dervish brilliance makes something sonically harsh stunningly beautiful. The piece is highly technical like a hummingbird wing beat or an engine, but magic happens as she breaks in and out of the lit space at the front of stage in strobe of arms. It is very direct and gaspingly good. Russell Maliphant comes to the stage with no lack of dance credentials. As the choreographer of all four pieces he has much to be proud of, but his first solo appearance in one of those modern dance uniforms of loose white linen is awfully underwhelming. The piece, called 'Shift' is made worse partly because it is so obvious that its creators think it is so very clever. Performed to a cello driven string quartet, an accompaniment that fights the industrial electro thrum for its place as dance's most predictable, this is a solo that begins almost as a slow workout. Maliphant dances between and across a set of spotlights that cast up to three shadowed silhouettes of his posed body on the back wall, which is itself let to create layered sections. The lighting effect is stagy but interesting but the performance is very mannered and without the effects is a pedestrian display of modern vogueing. The second half of the program, the eponymous 'Push', is the most problematic. The beginning is arresting. Guillem appears on Maliphant's back and shoulders in a series of poses, each one appearing and disappearing into total darkness. As they appear they are fringed with a penumbra of light, their movements slow and controlled there is a sense of mystery and ritual present. What follows is, for the most part, tremendously disappointing. There are fewer moments of the kinetic sculpture created between the pair that the beginning promises. Much of the time is spent in those with the pair circling one another in a stylized straight backed prowl, which is a standard modern dance cliché for some kind of emotional conflict. With far too many of these lazy tropes and a score, by Andy Cowton, that is at times excruciating 'Push' manages to become really very boring despite its early peak. Maybe the inconsistency between the acts in 'Push' allow us to appreciate the peaks all the better, although I'm sure that wasn't intentional. 'Push' succumbs to the current assumption that sombre slow portentous movement, discordant scores and chiaroscuro lighting equate with depth and artistry, the truth is light and shade can't hide the difference between good and bad. Fortunately there was enough of the former here to justify coming.